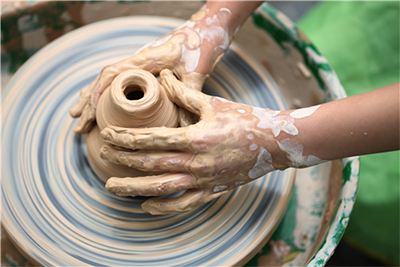 Come for a fun and relaxing evening that'll introduce you to the pottery wheel while you sip your favorite beverage. We'll show you the basics and provide time for you to experiment with various shapes. If you create some things you’d like to keep, we'll fire and glaze them for you to pick up a couple weeks later. So grab your BFF or co-worker and a beverage and enjoy a few hours with the wheel! This session is on Friday, May 17, 7-9pm. Christy Hyke is a former clay studio member at Crossings and now has her own studio in her Chatfield home. In addition to her pottery, she has a masters degree in Library Science and works at the Chatfield Public Library. Price is $28 plus $18 for supplies and $4 firing fee for each piece you make.